This article is about the soju brand. For the Starcraft II player who goes by the alias Jinro, see Jonathan Walsh. HiteJinro Co., Ltd. (Hangul: 하이트진로; Hanja: 眞露; Korean pronunciation: [tɕilo]) is a distiller in South Korea, founded in 1924. It is the world's leading producer of soju, accounting for more than half of that beverage's domestic sales. It also manufactures a variety of other alcoholic beverages including red wine and whiskey. Distilleries are located in Icheon, Cheongwon, and Masan, with the Masan plant geared toward exports. In addition, Jinro produces the Soksu brand of bottled water at a factory in Cheongwon. Jinro has been involved in exporting since 1968, when it began shipping soju to Vietnam in the midst of the Vietnam War. 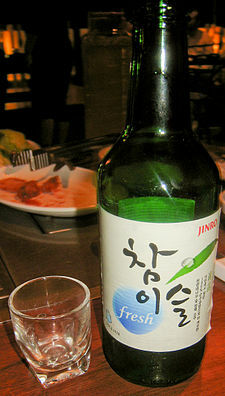 Jinro soju is known by the brand name Chamisul (참이슬). Part of their marketing strategy is to use temperature sensitive paper on their bottle label. A tab in the shape of an Asiatic Toad (the company's mascot) is white when the bottle is warm and becomes blue when the bottle is cold, indicating that the soju is ready to drink. In 2006, the company was acquired by Hite, a popular beverage company whose main product is beer. The target for 2014 sales are 2.2049 billion won, with an operating profit of 4.876 billion won; as a result, HiteJinro is expected to be the first liquor company in Korea to surpass 2 trillion won in sales. Jinro has been named the top-selling spirit in the world in the Millionaires' Club 2016, after selling 73.8m 9-litre in the year 2015. A bottle of Chamisul soju. On October 19, 1998, Chamisul, which debuted in the domestic soju market, broke the common sense that soju is 25% ABV and changed the image of strong soju to " soft and clean. "It is the best brand of domestic soju. As a byword for soju following Jinro, Chamisul changed the history of the soju market in terms of quality, brand power, and sales volume.It's a breakthrough. " Chamisul, " which started out as a 23% ABV product when it was released, is now 20.1% ABV and 17.2 degrees% ABV. These two brands are leading the domestic soju market. Chamisul, which has been gaining huge popularity by using bamboo charcoal filtration method when it was launched, has been renewing its products seven times. Chamisul has become a byword for soju, a single brand with more than 50 percent of the national market in just two years. "We felt tremendously responsible for social problems caused by drinking... we will help with efforts to change our drinking culture to a more positive one," said a sales manager at Hite-Jinro, quoted in Chosun Ilbo newspaper. Soju sales are soaring and foreign companies are considering buying into one of the few Korean industries to relish the economic crisis. But outsiders face tough, patriotic competition. ^ "HiteJinro > Introduction > History > 1972–1924". Retrieved 5 October 2016. ^ "Kim In-Kyu, Hite Jinro Co Ltd: Profile & Biography - Bloomberg". Retrieved 5 October 2016. ^ "Park Moon-Deuk, Hite Jinro Co Ltd: Profile & Biography - Bloomberg". Retrieved 5 October 2016. ^ "HiteJinro > Shareholders' Information > Shareholding Structure". Retrieved 5 October 2016. ^ "Jinro dominates Millionaires' Club list again". Alacra. 25 May 2016. Retrieved 5 October 2016. ^ a b "It's official: Jinro soju is the world's best-selling liquor". Cable News Network. Turner Broadcasting System, Inc. Retrieved December 15, 2015. ^ "Jinro Soju – the world leader". The Whiskey Exchange. Retrieved December 14, 2015.